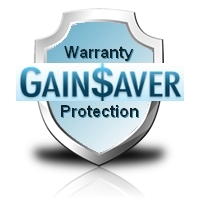 The GainSaver 30 Day Money Back Guarantee means youre covered. If you dont like the computer system you order from GainSaver, you can return it for any reason. You cant lose. Our "no questions asked" protection covers everything. So if you dont like it, you dont need to keep it. You have 30 days to make up your mind. With GainSavers Extended Warranty programs, you can extend the protection provided by our 30 Day Guarantee for up to three years. If you have any trouble with your computer during the warranty period, send it back for a free replacement. The Extended Warranty does not include accessories such as keyboards and power adapters. And returns under the Extended Warranty are for replacement or upgrade only, not refunds. If you have any questions call us at 800-844-4051.